Looking back on my own experiences going back to 1938 there has been always a concern that good times could not last forever. A profitable stock market will be invariably followed by periods of losses. Investors will nevertheless believe that ultimately an improvement in stock prices will always prevail. Faith in the ultimate growth of the US economy will compensate for the acceptance of short-term losses. Long-term gains will be realized. In the stock markets cyclical bouts of pessimism will alternate with exuberant spurts in optimism. George Akerlof and Robert Shiller – both winners of the Nobel Prize in economics – wrote about the gyrations in investor attitudes. Accordingly the economy is driven primarily by personal attitudes. We subscribe to that point of view. We view the stock market cycles as an amplification of personal sentiments. Our approach to investments is influenced by our detection of economic, social and structural anomalies. We look for deviations from what are generally accepted opinions about what are real events. Deviations must be examined for factual and quantitative indicators that anticipate a change in an expected trend. To examine a significant deviation we will start with an examination of the long-term trends of the GNP. Are there any indications that something unusual may be taking place? The real (e.g. deflated) income per capita rose steadily from $17,582 in October of 1960 to $50,172 in October of 2007. 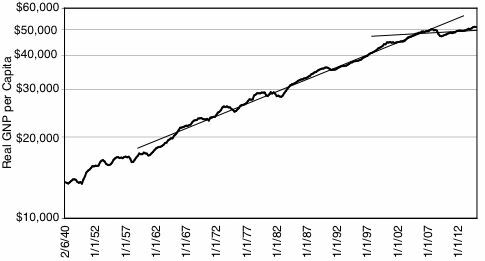 Real personal income of the US population thereby gained 285% in a period of 47 years, or a regular rise of 6.3% per year, without disruption. Former growth came to an abrupt halt when real personal income rose only to $51,164 since October 2007. In seven years, there has been only a 0.28% gain in GNP per capita per year. These increases took place in a wavering pattern and indicate an increasing uncertainty in the economy. The year 2007 break in the growth of the GNP suggests that retired investors may have to start reducing their expectations of future investment growth despite prognostications from the financial services industry.